Hello! I hope you're all having a great weekend.. it's the 4th of July holiday weekend for those of us in the US! A big thank you for all the sweet comments and emails regarding my new DT position with Sparkle Creations Rubber Stamps! Sparkle is sponsoring Sketch Saturday challenge for the month of July -- a couple of my fellow DT-mates are involved as well -- Simonne is on the SS DT, and Lisa is guest designing, so I thought that I would play along, too! 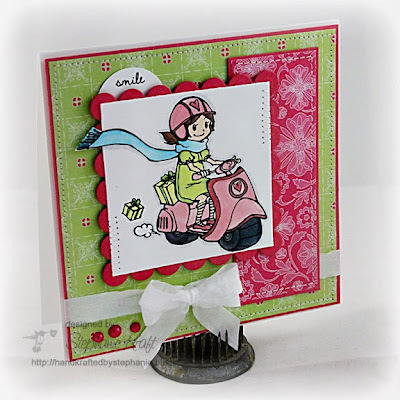 Please check out the Sketch Saturday blog for this fun sketch and a chance to win 2 unreleased Sparkle Creations stamps -- Surfing Oliver and Charlotte with Rose! 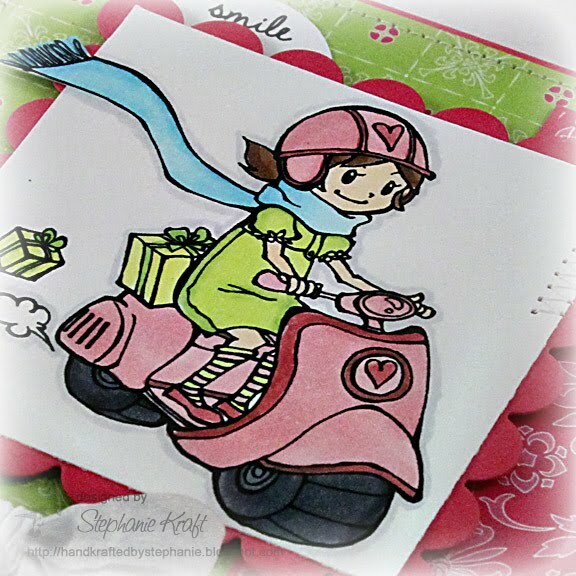 This image is actually called Scooter Chloe, though when my DD, Sabrina, first saw this image, she immediately said, "Scooter Sabrina", so she's already renamed the stamp AND now wants a scooter.. LOL! I was in the mood for bright colors, so I reached for my Cosmo Cricket DeLovely mini deck and pulled out a couple of the fun coordinating patterns. I colored her with an assortment of Copic markers and used a Lipstick Spica glitter pen to outline her helmet and scooter (though it's tough to see, it sparkles in real life). I tied some May Arts Wrinkled ribbon (yum-O!) around and added a double bow with my Bow Easy. Finally, I added a few Prima pearls and stitching all around. Accessories: Scalloped Square Nestabilities (Spellbinders), Circle punch (EK Success), Markers and Lipstick Spica glitter pen (Copic), Pearls (Prima), Wrinkled ribbon (May Arts), Bow Easy, Foam tape, Thread, Sewing machine. How cute! Wonderful coloring, she looks great with that CC paper! Hi there! Wow, you designs look wonderful! So fun to see how the stamps are being used. LOVIN ALL YOUR DESIGNS! super cute little scooter card! LOVE this Steph! She is the CUTEST! Oh I love your little scooter girl! Gorgous colour combo too! Your card is so sweet Stephanie, I love the funny image, love your coloring, great choice of papers! What a fun card! Love the cute image on her scooter. The paper is a great choice for the image. What a fun sweet card.